If you struggle with order in your kitchen, it can have a knock-on effect on the rest of your home! These 4 kitchen habits you need to adopt will help you tackle and tame your kitchen and put you on the right path for the rest of your home! Your kitchen is the heart of your home, it is where everyone seems to gather and making sure you keep it in top shape makes it easier to manage the long-term cleaning and organizing of this room! If you follow these 4 habits and practice them daily keeping your kitchen clean and organized is easy! Put things away! 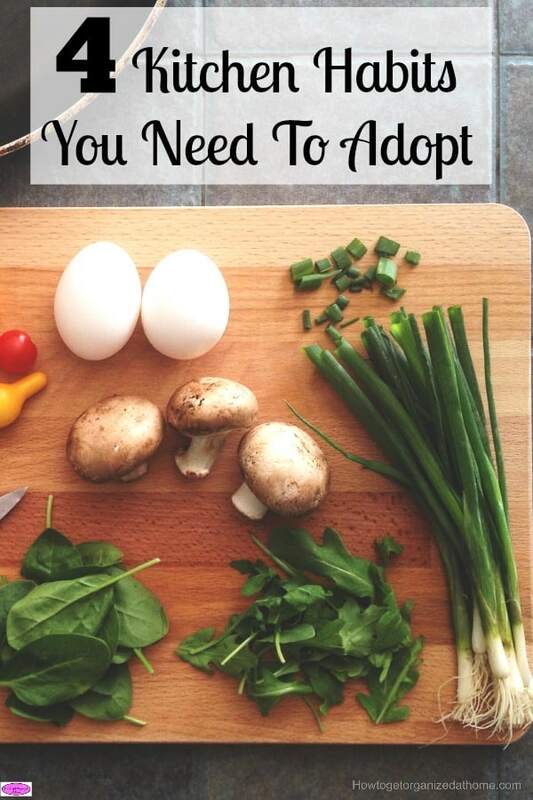 Your kitchen isn’t the place to dump everything and leave it there! You must get into the habit of putting things away. Don’t leave things to tackle later, that either never happens or the pile has built up so the task becomes a mountain to climb! Tackle the dishes after every meal. This helps to maintain the area, it is difficult and don’t get me wrong, my home is not perfect and never will be, however, I know that if I do the dishes immediately after a meal I feel better. Keep the clutter at bay! The easiest way to do this is not to allow anything on your worktops that doesn’t belong there. The clearer your counters are the easier it is to keep them that way. It is also so much easier to wipe down if they are not covered in clutter! Clean your sink daily. This is something that does help me start the day on a positive note! Coming into the kitchen in the morning and seeing a clean sink, it sets the day off to a great start! Adopting a new habit isn’t easy, it takes time, commitment and lots of practice. However, if you are trying to tackle a new habit it is often a good idea to only add one habit at a time. You need to give yourself at least a month for each new habit you are training for! Don’t give up, habits will form and you will feel better in the long-run when you can clean your kitchen and put away the dishes without paying much thought to the process! If you want a new habit to form you have to take it slow. Allow for mishaps, or when you forget the next step in your habit. After all, you are still in training mode! If you are tackling clutter, just moving it from one room to another is just moving the problem. It is better to tackle the problem head-on and not just transfer the problem to another day! If you try to organize more than one area at a time, chances are you will end up with a massive pile of items that you need to find homes for and you just give up! If you do one small area at a time and tackle everything, finding a home or just putting it away, then you accomplish more than you could possibly imagine. If you just move an item to a new area with the hope of finding it a home, chances are high that it will stay there gathering dust until you think about organizing that space! If you tackle them after every meal, even if you are just putting them in the dishwasher (this is the dishwasher I would love to have!) means that your kitchen is kept clean and tidy and not attracting germs or animal activity in your kitchen! For me cleaning the sink was something that the Flylady suggested when I was trying to tackle my depression and amazingly it helped! It was such a simple task but it did help, it helped me take back control of my home and not feel so overwhelmed by everything. It is also one of those areas that can quickly smell and keep it clean and fresh prevents this odour from building up and taking over your kitchen! 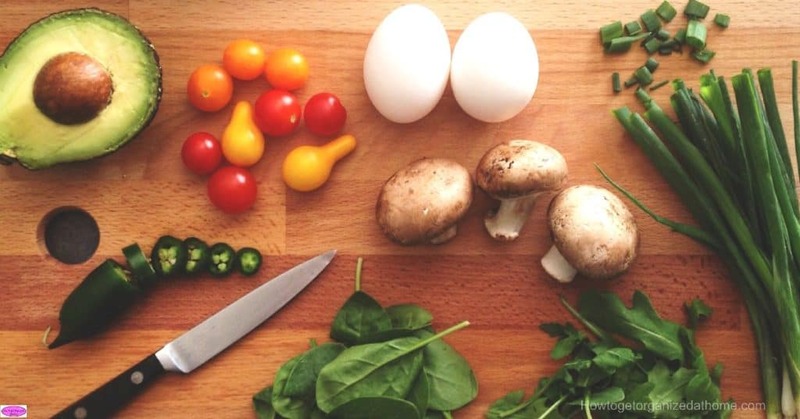 Therefore, if you are looking for habits to adopt then these 4 kitchen ones will help you take control of your kitchen and make sure that it is ready for all those cooking tasks! Looking for more articles on creating habits? The Idea Of Simple Living To Make Life Easier is a great place to start! Luckily, my OCD husband ensures all the above are carried out. In fact he often puts things away which I have just gotten out to use, left the room for a moment, to find, when I return it is all tidied away!!! At least he puts things away for you!